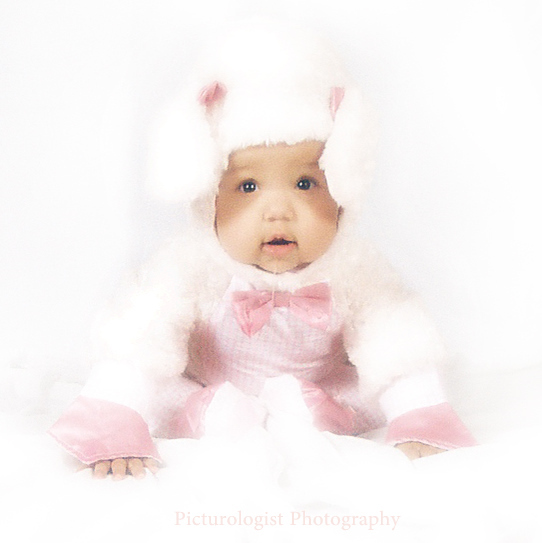 Mary had a little lamb and she got it from Wholesale Costume Club! I know what you are thinking... A costume for Easter?!?! But look how cute she! I was given the opportunity to review an Easter costume through Wholesale Costume Club's infant and toddler selection of costumes and I was pleasantly surprised by the selection and the material. First of all, I never think about costumes for baby other then Halloween and when I do... it is a always a half hearted trip to a major clothing store's website who has cute and cheap costumes appropriate for baby. I only dress baby for Halloween for the cute picture; not for trick or treating and dressing the baby for another holiday...? So, when I took a look at the selection for Easter, I was excited! I could see the photo opportunities! I was really torn with which costume to choose... the bunny, the bunny cape... so many choices! 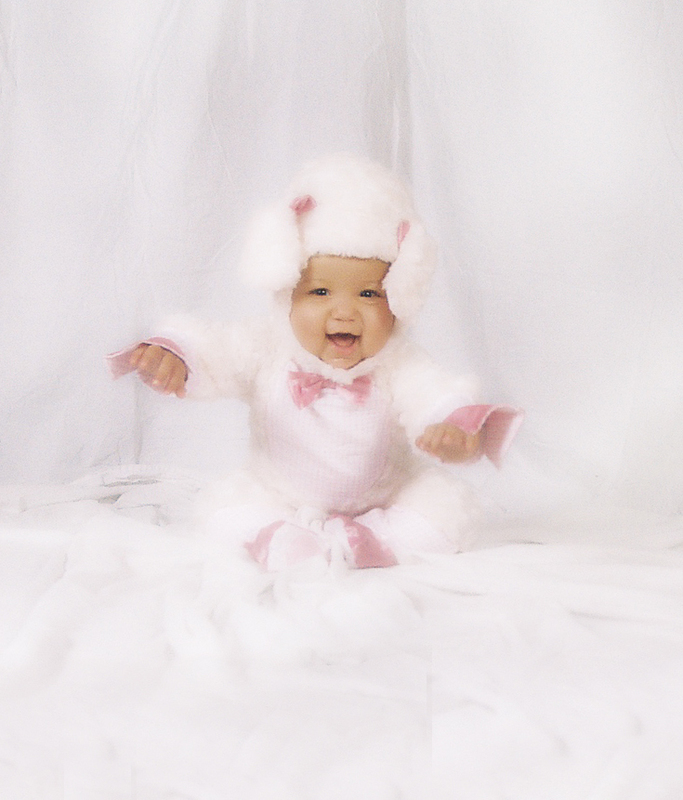 I ultimately picked the Infant Pink Lamb costume. I also checked out some other costume sites for the same costumes and all but one was more expensive then Wholesale Costume Club. The one that was cheaper only had ONE Easter costume and it was not my favorite... besides that one costume, that had only one size option (that would not fit my baby) and shipping was more. So far I am really liking this Wholesale Costume Club... better prices, cheaper shipping and if you become a member the prices are even lower. The cost for the yearly membership is only $5 and it is not automatically renewed so no surprises if you don't use the website again. I can see this as a huge bonus with two kids and a husband who get dressed up for Halloween (okay and me). I can also appreciate the layout of the site... nothing is hidden. Prices are right there and you don't have to add your purchase to the cart to figure out shipping cost. It is THE softest costume I have ever touched... I mean ridiculously soft, I could not stop touching and petting this costume it is that soft. The costume is also really light weight. Looking at it I thought for sure it would be a pain to put on her but it is made just like PJs and has snaps to open from the bottom for easy diaper changes. Even the lamb's hat was light and easy for her to wear - in other words she did not try to tug it off, not that she could, it is secured under the chin by two snaps. My only issue with the costume was that when I pulled the snaps at the top apart - one of the snaps pulled away from the fabric. A quick email to the company and was told that any orders under $15 they would replace for free and anything over could be exchanged and they would cover shipping both ways. As you could see it did not stop us from taking pictures!